Berry-Boger Yacht Sales, Inc. was founded in 1984. It was started on the belief that a better purchasing experience could be provided than the founders encountered elsewhere in the industry. In all the years that followed we have strived to provide that better level of service than our competition. As South Carolina's oldest brokerage firm operated under the same ownership, we believe we have succeeded in our mission. We continue to improve our customer relations, marketing, and technology to provide the best service available for our buyers and sellers. Located at Harbourgate Marina since 1988, Berry-Boger Yacht Sales is positioned to provide every thing a buyer and seller needs. 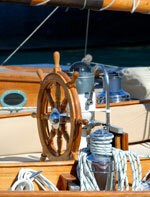 Boatyards are close by as well as hotels, restaurants, vessel dockage and boating supplies. Myrtle Beach is an excellent venue to sell your boat. Yet our services are not limited to Myrtle Beach. We have agents in other cities who can help sell your boat. Also, our brokers travel for their customers in order to provide the best service possible. So no matter where you are located, we can help. Our firm has survived the luxury tax and bad economies. While the challenging times are difficult, each time we have emerged stronger with a greater share of the market, and better able to help our customers. With your help we look forward to many more years of service to the boating community. Berry-Boger Yacht Sales is a member of The Yacht Brokers Association of America and the Florida Yacht Brokers Association providing professional representation to both buyers and sellers along the U.S. eastern seaboard and international locations.